In a picturesque street in the outskirts of Phuket sits one of the biggest and most modern gyms in the world where the MMA elite gather to sharpen their skills. Thailand and the island of Phuket have become popular destinations for tourists for a long time. Besides the islands’ many beautiful beaches and attractions, a lot of tourists visit for the chance to better their Muay Thai and the opportunities to find great Muay Thai gyms in Thailand are limitless. Former top ranked UFC fighter and “The Ultimate Fighter” season 1 competitor Mike “Quick” Swick (15-6-0) was one of those people. He often travelled to Thailand to sharpen his Muay Thai skills, but there was one problem — the possibility to integrate it into his MMA training wasn’t there, as Phuket didn’t have many places to train MMA, wrestling or Brazilian jiu-jitsu. Chalong is situated far from the busy and crazy bar streets of Patong. A 30 minute drive from the city by bike – along a beautifully scenic ride along the coast – takes you to Soi Sermsuk in Rawai. Upon seeing the big AKA (American Kickboxing Academy) Thailand sign, and a short ride on a narrow street, suddenly the gym’s parking lot appears and the big green buildings with the AKA Thailand logos are impossible to miss. MMAnytt arrived on a Sunday morning in early February, with the intent of watching AKA product Luke Rockhold take on Yoel Romero for the UFC interim middleweight title at UFC 221. There was a lot of anticipation in the air and the roughly 20 people looking at the fights in The Contender Cafe were certainly disappointed with the outcome after Rockhold suffered a third round knockout loss. Of course the gym being situated in THE hotbed for Muay Thai, AKA Thailand provides a world class Muay Thai curriculum. They also provide amazing coaches for BJJ and MMA, with a focus on techniques that fits into an over all MMA game, as well as it’s individual aspects. On site they have the – according to AKA founder Javier Mendez, best pad holder in the world Dillon Croushorn. Croushorn is not only an experienced 9-time Muay Thai World Champion – he has also had a couple of MMA fights, which means he has a deep understand of which striking techniques does, and doesn’t work in MMA. A modern gym with all the tools needed to become a better mixed martial artis – in the middle of paradise with nothing but djungle and mountains dominating the horizon. It’s an excellent place to settle down and focusing 100% on bettering yourself as a martial artist. MMAnytt spent two full days at the gym, getting the opportunity not only to watch the pro’s train – we also had the chance to do a beginners class of Muay Thai. In the beginning of the Muay Thai session it was clear that everything was well organized, every person getting a bracelet with a different color. This helped the teachers make sure that everyone had the chance to get individual attention – be it kicking and punching pads, light sparring or throwing combinations on a heavy bag. Camraderie was a great part of every training session – regardless of skill. At the end of the pro training the team meeting with Swick, Marcio Cesar and Anastasia Yankova was very inspiring and gave the students a chance to hear the way a successful fighter’s brain works. AKA’s BJJ trainer Marcio “Gracinha” Cesar has over 30 MMA fights and have trained with legends like Wanderlei Silva, Mauricio Rua and Renan Barao also explains the mentality an aspiring professional needs to have. The students in both the pro class and beginners class came from all over the world: Finland, Russia, Cambodia, US, Iran, Canada, Australia and many more. Swick’s dream was to create a world class MMA gym where anyone could come and train, regardless if you are a professional or a novice. If you are just looking to lose or gain weight, sharpen up your Muay Thai skill or bettering you over all MMA game, AKA Thailand was built to suit those needs. The gym is also close to Rawai beach which gives a great opportunity to train in a different setting and also having the cooling ocean as a reward after your hard work. It’s a great opportunity to break up the monotiny of the gym. While walking around the premises, you could see pictures of all the super stars that have travelled to the gym to take advantage of the world class training throughout the years. On the walls you can see pictures of legends like Chuck Liddell, Mark Hunt, Cody Garbrandt, Luke Rockhold, Cris Cyborg and many more. 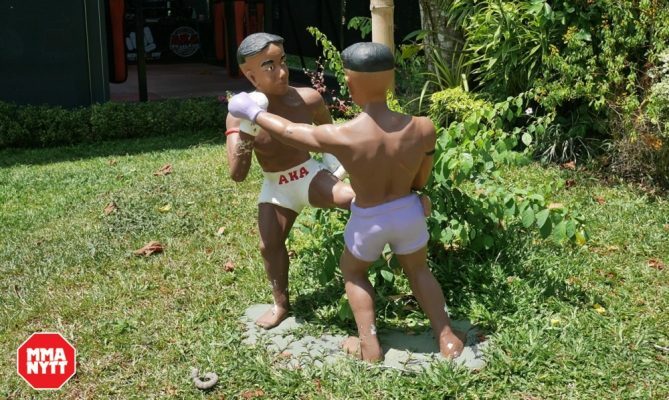 In the MMA area pictures of AKA San Jose and AKA Thailand fighters are plastered on the wall – veterans like Mike Kyle, Daniel Cormier and Josh Thomson, as well as lesser known mainstays at AKA Thailand such as Amir Aliakbari, Wang Sai and Jeff Huang. The same goes for UFC heavyweight Mark Hunt, who stops by the gym whenever he goes through Thailand. “I’m looking forward to another fight camp at AKA Thailand.” – Mark Hunt about his preparation ahead of his rematch with Antonio Silva at UFC 193.